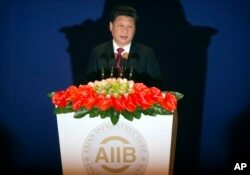 Editor’s Note: It’s been more than a year since the China-led Asian Infrastructure Investment Bank (AIIB) was launched. The bank is already helping to meet the financial needs of emerging economies to enhance their infrastructure – the bank’s focus. On the sidelines of the World Economic Forum in East Asia, held in Phnom Penh last week, AIIB Vice President Joachim von Amsberg sat down with VOA Khmer’s Aun Chhengpor to discuss the bank’s expansion, the possibility of the US membership, and rising multilateralism in Asia. VOA: With the existence of established international financial institutions like the World Bank and Asian Development Bank, why does Asia need the AIIB? Joachim von Amsberg: The infrastructure financing needs of Asia are so large. There is no single institution or there is no single bank that can meet all the financing requirements. Some of those studies that have been done show that there is a need to invest trillions of dollars every year in infrastructure – in power, roads, railways, water, and telecommunication. There is a strong recognition that more investment in infrastructure is needed. Now the existing multilateral development banks – the World Bank, the Asian Development Bank, and others – are investing in infrastructure, but their capacities are limited. They can only invest so much in each country and so much in each sector. Another reason to found this Bank was to create a bank that is, one, focusing on infrastructure, and two, led by Asian and emerging economies to meet their needs. VOA: How have the bank’s operations gone so far? JA: In fact, we have made 13 investments. Last month, we approved the first loan in India. But we have made 12 other financial commitments in the last year already. We have invested in Indonesia, Myanmar, Tajikistan, Pakistan, Bangladesh, Oman, and now in India. We have committed more than $2 billion already in our first year of operations. So, in fact, we have got off to a pretty strong start because there is so much demand for infrastructure finance. We are receiving many requests for financing from governments -- but also from private project sponsors from other development banks. And we have financed a wide range of projects ranging from very small scale local infrastructure. For example, in Indonesia, we have invested in an urban slum upgrading project, so that will finance small roads and small water connection – very small scale works in many, many urban areas. On the other hand, we have invested in very large-scale infrastructure. For example, very large gas pipelines from Azerbaijan through Turkey that ultimately connect the European gas market to Azerbaijan. VOA: Is there a direct connection between Chinese President Xi Jinping’s ‘One Belt, One Road’ initiative and the creation of the AIIB? JA: One Belt One Road and AIIB are two very different items, they are also connected. 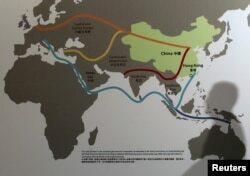 They are very different because One Belt, One Road is a very broad initiative by China to promote economic connectivity and trade, in particular, between Asia, Europe, and Africa. But it is a very loose and very broad initiative. But it has now found support from many other countries, who are seeing it as a signal of promotion of openness, promotion of trade, [and] promotion of economic integration and opportunity. In contrast, AIIB is a bank – a bank with a legal framework, very clearly defined governance, and the ownership of now 70 member countries. So, AIIB is a multilateral organization or an international organization owned by 70 countries. Each of those 70 countries has a role in the leadership of AIIB and is considered in the decisions that AIIB takes. But, of course, the two are connected because many of our member countries are located in the One Belt, One Road corridor. So, we expect that there will be cases that our member countries will present some of the projects connected One Belt One Road to AIIB for its financing. But we will finance them because of their priority as our member countries, not because they are part of One Belt, One Road. VOA: How can the AIIB work with other, more established lending institutions, such as the World Bank? AJ: From the beginning, AIIB has worked closely with the existing international financial institutions. In fact, we have co-financed a very many projects where the World Bank or the Asian Development Bank or European Bank for Reconstruction and Development have taken the lead in preparing those projects to the partners. Out of the 13 investments financed by the AIIB so far, nine are financed together with other international financial institutions. This is a very healthy and very strong partnership because it helps us, AIIB, to learn from the experiences of the long established development banks and, also, send to the clients the message that we work in partnership, in particular, that we uphold very high standards of project quality. VOA: Will the AIIB take the same approach as other lenders who tie financing to improvements in human rights conditions, environmental safeguards, good governance and corruption? AJ: I expect that the AIIB will take a more focused approach because we have been founded in order to address the infrastructure finance gaps. So, we will be more focused on infrastructure financing and on project finance. We do not have the resources to advise countries on broader economic development or institution building. Those are important issues, but they are not the focus of the AIIB. VOA: Might the United States and other countries which are core members of the World Bank become members of the AIIB? AJ: From the beginning, AIIB has been set up in an open way, inviting all countries, and, in particular, all member countries of the World Bank or of the Asian Development Bank to join our new bank and become part of the AIIB. That open invitation will continue, and any country that is member of the World Bank and the ADB can join and apply for membership at the AIIB at any time. And, we will be very welcoming, and, of course. In the beginning when the idea of AIIB was first floated, I think there was quite a bit of skepticism – maybe even suspicion – that this might be a Chinese-only initiative that would promote Chinese interests. I think, in the last two years, that suspicion has given way to understanding and trust that AIIB is a truly international organization. VOA: What are the main challenges facing the AIIB looking back over its first year? AJ: I think the important challenge for us as a new organization is to prove our value added to our clients and to show that we can help solve the infrastructure finance paradox. The infrastructure finance paradox is that there is plenty of money out there they would like to invest in infrastructure, on the one hand, while, on the other hand, there are a lot of needs for infrastructure investment in Asia. And, yet, there is very little private finance is going into developing countries’ infrastructure: that’s the paradox. We have to show that we can help increase the investment. We have to show that, when we get involved, other investors are comfortable to invest alongside us. So, our participation makes more and more projects viable. And, we can help reduce the paradox and allow more private capital to flow into infrastructure projects in developing Asia. VOA: Do you think the trend towards protectionism in the West could threaten the AIIB’s goals? AJ: I think Asia has proven the benefits of trade and the benefits of economic integration. Over the last decades, hundreds of millions of people have been raised out of poverty because of the economic developments driven by trade and integration. And we see AIIB as an expression of that belief in connectivity, integration, and trade. We want to be a facilitator because connectivity means physical investments and that is what AIIB comes in to play. VOA: Has the AIIB been concerned by the economic slowdown in China? AJ: I think China’s experience in the last decades has been absolutely extraordinary. The transformation of China over the last decades has occurred in a speed that is unprecedented and probably cannot be easily replicated nor continued. So, I would see the development that China has been moving toward growth rates that are probably more sustainable as healthy development that, of course, naturally, as China’s income has risen so much in recent decades. I don’t see sign of any particular dangers coming out of China’s convergence toward, I think, more sustainable growth rates. I think that China’s growth will still be an engine for the world’s economy and, certainly, an engine for developments in Asia. VOA: How can Cambodia, as a minor shareholder in AIIB, contribute to and benefit from the project? AJ: Well, Cambodia is part of Asean and part of the first group of countries that joined AIIB as a new bank. So, for us, Cambodia’s shareholding of AIIB is actually very important. Cambodia contributes and participates in different ways. 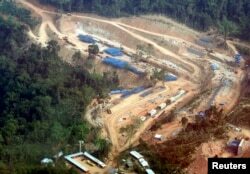 One, Cambodia is a shareholder that is heard as part of our board of governors and board of directors. Secondly, we expect that we will invest in Cambodia. We believe that particularly smaller countries like Cambodia will benefit even more from economic integration than the larger economies. Typically, a small economy is even more dependent on economic integration with its neighbors. And, therefore, connectivity is particularly important for an economy like Cambodia. VOA: Has Cambodia submitted any proposals for finance from the AIIB? AJ: We had preliminary discussion on different ideas of where and how AIIB could invest in Cambodia. We have not decided on specific investment, but we are sure that we will invest in Cambodia as one of our founding members.